Empfänger auswählen ...TROMP GROUP BVPresident Ken NewsomeSenior Sales Manager Henk HoppenbrouwersMarketing, Communication & International Fairs Erik Smink Bitte wählen Sie einen Empfänger aus. The Tromp Group develops and produces integrated systems and stand-alone equipment for the bakery industry worldwide. With best-in-class unit equipment we enhance the quality and efficiency of your bakery line and supply complete solutions for sheeted breads, cakes, muffins, pizzas, pastry, laminated doughs, pies and waffles. The Tromp Group consists of two brands: Tromp Sheeting & Depositing Systems and Den Boer Baking Systems. Tromp Sheeting & Depositing Systems, located in Gorinchem, Holland, designs, produces and sells equipment for the global dough-processing food industry. The Company is specialist in solutions and equipment for Sheeting, Laminating & Make Up, Pressing, Depositing and Decorating. 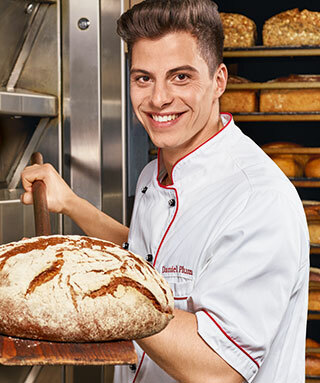 Den Boer Baking Systems located in Dalfsen, Holland, is leading developer and producer of equipment in the field of heating and cooling for the industrial bakery industry. The Company is specialist in solutions and equipment for Proofing, Pan & Tray handling, Baking and cooling. The Tromp Group Test & Innovation Center helps customers develop the highest quality products using the most innovative technologies and industry's most reliable bakery equipment. The test center features a climate-controlled environment to match your local factory environment. State-of-the-art equipment and expert consultation guarantee the most optimal production solution. Optimize, adjust and fully test your product in the center to avoid disrupting production within your own plant! In this, more than 1.000 sqm area, customers and prospects are more than welcome to have the experience of working with superb equipment. There is a complete multifunctional production line and a dough making section, working according customer’s specification. The testing area includes also a Den Boer Multibake® tunnel oven and a Continuous Mixing System from Reading Bakery Systems to use an optimum delivery of dough at the right temperature and humidity. Efficient production for clients is the first concern. By providing a full-service portfolio Tromp Group aim for a long-term relationship, to maximize value from the equipment. The service portfolio includes a 24/7 helpdesk, remote service, parts and upgrades, preventive maintenance and training and technology support.